RBTH presents a selection of views from leading Russian media on international events, featuring reports on two strong resolutions on Russia passed by the European Parliament, Russian President Vladimir Putin's visit to Italy, and new data on public opinion in NATO countries on the issue of supplying arms to Ukraine. 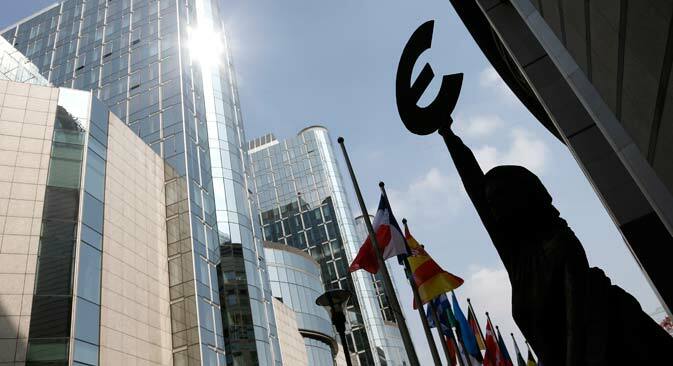 The European Parliament has adopted two resolutions on Russia, the business daily Kommersant reports. According to the newspaper, one of them affirms that the EU will never recognize the Crimean referendum of March 2014, and points to the "critical" significance of coordination between the European Union, NATO and the U.S. on the situation in the Black Sea basin. “The purpose of the document is to draw a strategic line on what the relationship between the EU and Russia should look like in the near future, as well as to assess the recent cases of violations of international law on the part of Moscow,” the author of the document, Lithuanian Member of the European Parliament Gabrielius Landsbergis, told Kommersant. The key thesis of the resolution is that Moscow can no longer be regarded as a strategic partner of the EU. The European Commission has been recommended to develop a new strategy for relations with Moscow. The specific proposals include increasing funding for projects to “counter Russian propaganda and misinformation within the EU and abroad,” as well as boosting support for Russian civil society. Despite the tough tone of the document, many European Parliament ministers have spoken about the need to improve relations with Russia, and some have warned that EU policy could lead to “an apocalyptic clash of two civilizations,” writes the newspaper. A representative of Russia’s Federation Council told Kommersant that there are just “a couple of dozen Russophobia-affected figures” in the European Parliament, who, however, keep it under control. Moscow believes that it is possible and necessary to work with the rest, the newspaper concludes. The centrist daily Nezavisimaya Gazeta reports on Russian President Vladimir Putin’s visit to Italy, during which he visited the Expo 2015 World's Fair, held talks with Prime Minister Matteo Renzi and met with Pope Francis. According to the newspaper, Renzi and Putin discussed the sanctions from the perspective of bilateral cooperation, as well as the implementation of the Minsk peace agreements to resolve the situation in Ukraine. Economic issues were also addressed at the meeting; in spite of a 10-percent fall in turnover by the end of 2014, Italian businesses are maintaining an interest in the Russian market. Andrei Kortunov, head of the Russian International Affairs Council, told Nezavisimaya Gazeta that as far as altering the sanctions regime was concerned, Rome’s options were limited: “The Italian side is subject to certain limitations and cannot go beyond the mandate of the EU,” he said. He pointed out that even if Moscow had had plans for a special position regarding sanctions or other issues, they clearly could not be fulfilled. On the other hand, Kortunov believes that Italy’s opinion will be taken into account at the formulation of long-term relations between Russia and the European Union, therefore the Russian leadership may hope that Rome could become a kind of lobbyist for the Russian Federation in its relations with the EU. “Italy is not ready to break relations with the European Union partners over the main issues. But in case of some specific questions, it may carry out an independent policy,” Kortunov noted. The online newspaper Gazeta.ru reports that citizens of many NATO member countries have a negative attitude toward the idea of supplying lethal weapons to Ukraine. According to a survey conducted by the Pew Research Center, an average of only 41 percent of the alliance’s citizens approve of sending arms to Kiev. The website adds that the greatest support for the initiative was recorded in the U.S. and Poland, with 46 percent of Americans and 50 percent of Poles in favour of sending weapons. Germans are the least willing to supply Ukraine with arms; only 19 percent approve of the idea. This is despite the fact that only 26 percent of respondents are positive toward Russia, a figure 11 percent lower than it was two years ago, Gazeta.ru notes. Western experts pay the greatest attention to the fact that citizens of the member countries are questioning one of the basic principles of the Alliance – Article 5 of the Washington Treaty, according to which an armed attack against one NATO country is considered as an attack on NATO as a whole, the website says. According to the survey, the majority of respondents in Germany, France and Italy believe that their countries should not use force in case of a military conflict between Russia and one of the NATO countries. Sergei Utkin, head of the Strategic Assessment Department of the Center for Situational Analysis at the Russian Academy of Sciences, said in comments to Gazeta.ru that differences in outlook between NATO member states is "not news." "In all cases when NATO mechanisms have been applied in practice, the participation of individual countries in NATO operations was non-uniform," he says. Utkin believes that a number of countries belonging to the alliance are unable to provide significant military assistance even if they have a strong desire to do so. "The member countries that fear external threats understand that in case of emergency, they can get military assistance only from the United States, perhaps with the limited participation of the United Kingdom," said Utkin.